The first great thing when you have big, large windows all over your home is …God, you have light! And your home feels warm and cozy in sunny weather. But, like everything in life, there’s a downside to this also. Perhaps you want to try some deep sleeping from time to time and… paying less on the electricity bill would be nice as well. Well, to „tame” down your big, large windows, you should cover them with good, high quality curtains. You can find a selection of the best of them here. Surf a little and get an idea about what there is on the market for your windows. In order to get privacy and less light through your large windows, you do need to get large curtains. There are some steps to follow, though, when looking for ones. 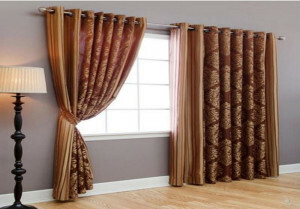 You should decide whether you want your windows to be functional or decorative before buying any curtains. You can do both, no worries! Another thing to consider is the money that you want to spend for the curtains. Treating a window individually costs different when you group the windows together, remember. You can treat several windows as one by pairing the curtains together on just the outer edges. You can spare some money by creating stationary curtains just one to two widths each. You can add a shade behind the curtains and go for motorized curtains if the room is tall. A remote control can operate up to 5 separate windows! To soften the light from large windows, you can hang sheers on a rod from one wall to the other. The sheers have no lining so they’re not expensive and they don’t look bulky either. You can add lightweight panels over your large windows, creating the illusion that there is no break between them. To get privacy also, mount shades behind the panels. You should use a rod longer than the windows to obtain a wall-to-wall look. Pull back the curtains to one side (use a traverse rod in this case) to still enjoy the view given by the large windows. Traverse rods come in plain and decorative styles, so you can get creative with that! Get two smaller rods if you want your curtains to be non-sliding, eliminating the one single rod that goes all the away across your windows. If the windows are actually close together, you can use a metal or wood pole with a curtain over each window. If you also have a „one-of-a-kind” shaped window in the center, leave it without curtains- you’ll get a more dramatic effect! You should also consider a cornice when you have large windows. If you measure right and install it correctly, they can cover any functioning blinds you don’t want to see. Draping a long scarf across your large windows may create an elegant look. A scarf lets light go through, unlike a valance. If your house has a large group of wide windows, you can treat them as one, using a roman shade across them. If none of this suits your taste, go for the stationary curtains on the sides to obtain some structure. It’s gonna give your home a soft feel, indeed!